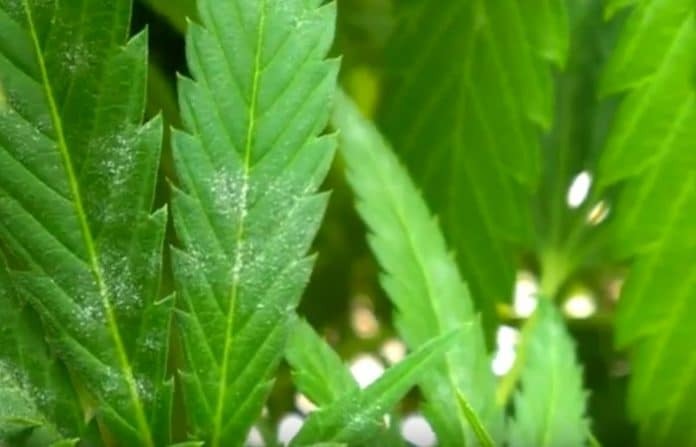 Powdery mildew affects many plants – including cannabis. A new eco-friendly solution may be on the horizon for commercial growers. Powdery mildew is a fungal disease that thrives in high humidity and moderate temperature environments – such as indoor grow areas. In cannabis grown for medicinal purposes, it can have a devastating effect on plants; affecting photosynthesis and yields of the sought after therapeutic compounds tetrahydrocannabinol ( THC) and cannabidiol (CBD). Even if treated, few medical cannabis patients would want to use a product they knew came from an affected plant. Chemical control of powdery mildew is often performed with fungicides including triadimefon and propiconazole; but these are rather toxic and have been banned for cannabis application in some parts of the world – or just banned entirely. “Greener” controls include raising temperature, garlic sprays, mixes of soap, baking soda and vegetable oil, and UVC lights. An associate biology professor at New Mexico Tech in the USA is working on another solution. Dr. Siv Watkins is working with an organism that can stop powdery mildew in its tracks and prevent it from taking hold in the first place. Dr. Watkins says the unnamed organism doesn’t harm the plant and has no effect on humans. Everything seems to be rather hush-hush about this organism while Dr. Watkins and the University go through the process of obtaining a patent for the discovery. Dr. Watkins was mentioned earlier this year in relation to a bill to establish a fund in New Mexico’s state treasury for research related to the production, uses, effects, and efficacy of medical marijuana. The New Mexico State House subsequently voted 41-26 to pass House Bill 155. Pesticide, herbicide and fungicide use in medical cannabis cultivation has come under increasing scrutiny after concerns the situation was getting out of control. Last year we mentioned 84.3% of cannabis samples submitted to a lab in California tested positive for pesticide residues. The issue is one of the reasons industrial hemp has somewhat of an edge as a source of CBD – as it is grown outside and is a very hardy plant; requiring little chemical treatment. Next articleA Medical Cannabis Treatment Option For John McCain’s Brain Cancer?